Don’t mistake alphabet pieces for just being toys! The benefits of letter manipulatives are incredible. 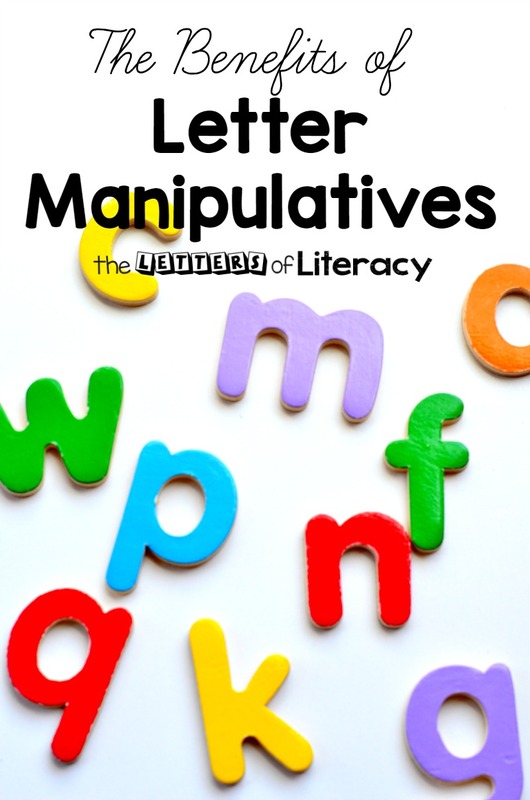 Not only are letter manipulatives fun, but they are also a great teaching tool. Letter manipulatives are as important as having a visual alphabet around! 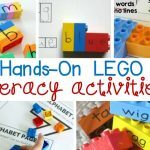 These small pieces are setting the stage for reading, writing, visual discrimination, and more literacy foundations. 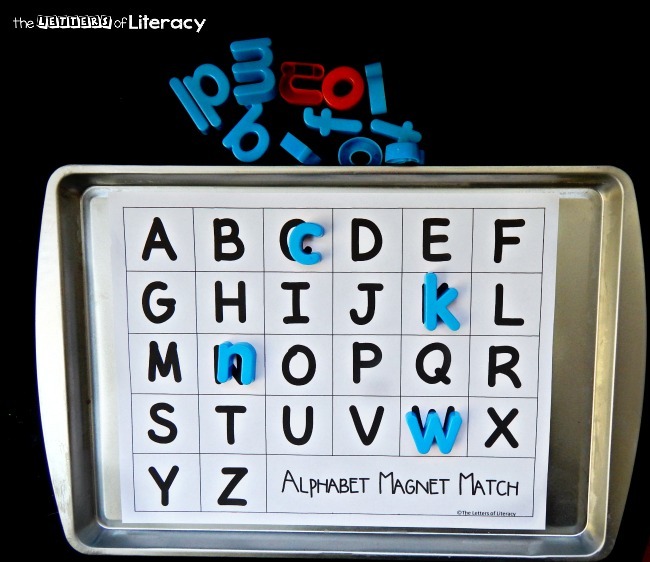 Letter manipulatives give children a way to interact with the alphabet through hands-on play. 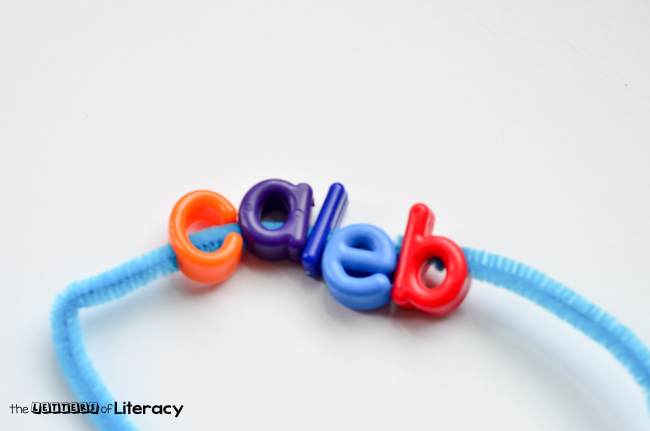 They are able to feel the shape of the letter and arrange multiple letters to form letter strings or words. 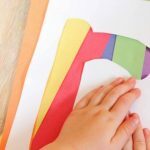 They can see the curves and the lines that come together to form each letter, and some letter manipulatives even allow children to explore letter formation and tracing. 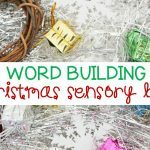 Young children love letter manipulatives, and there is great value in setting up a letter manipulative sensory tub, making a simple game with letter beads, or even having children explore with letter lacing beads. 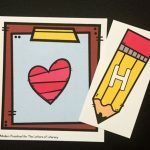 A letter manipulative is perfect for the child who is not able to write yet, and it is also important for children who are beginning to read and write. 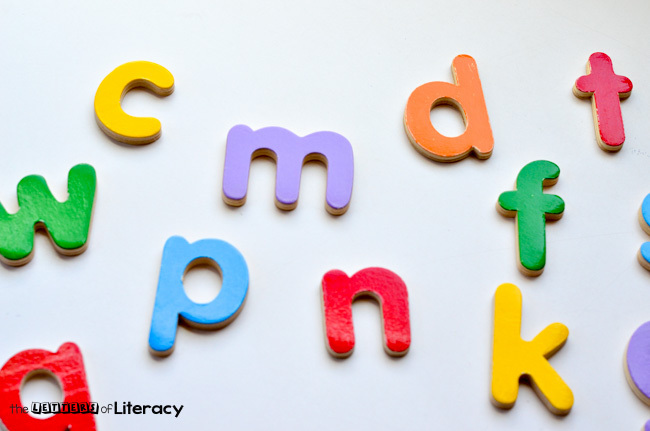 Letter recognition is a key step in a child’s ability to learn to read and write. As children play with letter manipulatives, they are gaining knowledge about the letters they interact with. They can see the difference between ‘Y’ and ‘B,’ and they can also feel it. 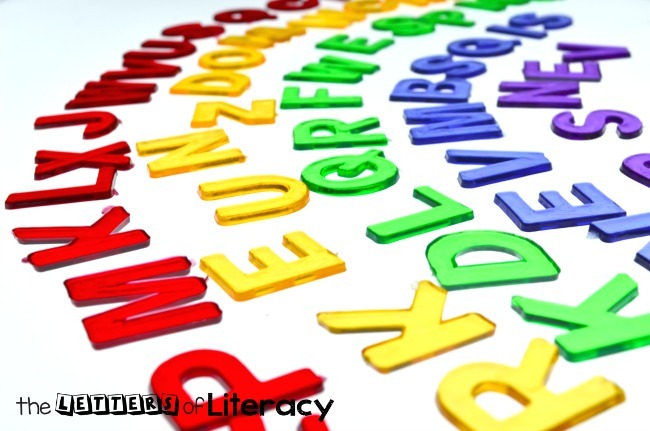 Children typically look for letters they are familiar with. One of the very first words with great importance will be their own name. Next, they will begin expanding their letter knowledge to the rest of the alphabet. Eventually, these skills grow into the ability to start identifying and associating upper case and lower case letters. 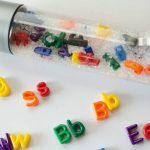 This sensory bottle is a great lower case and upper case letter matching recognition game to use with letter manipulatives. After learning letter recognition, a child will progress on to learning letter sounds. At first, a child will be able to identify some letter sounds. Again, they will start with letters they are familiar with, especially the first letter of his or her name. 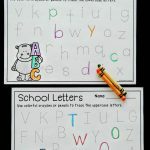 As they gain confidence and mastery in this, they will move on to the rest of the letter sounds of the alphabet. After this, you will see them use letter manipulatives and sounds more intentionally. When talking about a cat, they will want to see which letter says /c/. This is also a great time to talk about how letters can have multiple sounds. Learning letter sounds with letter manipulatives has endless opportunities. 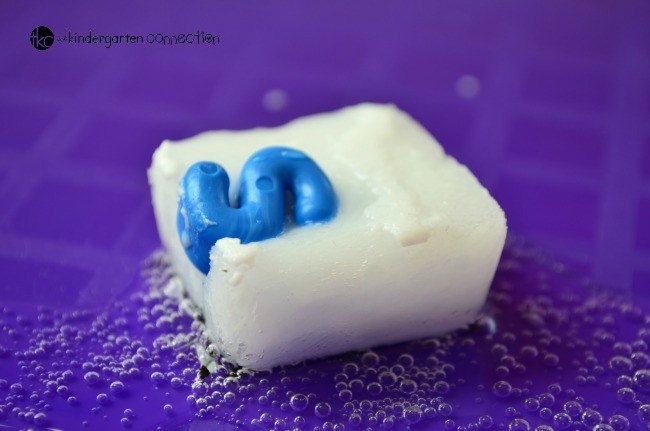 One of my favorite ways to use letter manipulatives to figure out beginning letter sounds is this fun science project with letter beads, Toob creatures, and ice cubes. One of my favorite ways to work on word formation is with the Melissa and Doug See and Spell game. 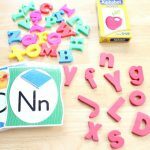 The wooden letter manipulatives are great quality and give the child a visual picture of the word they are spelling, as well as the shape of the letters. When children understand letter sounds, they will begin to form the words they hear. They will be able to break the word “Sam” into three sounds: /s/ /a/ /m/. Then they will be able to replicate those sounds with the letters to form the word. 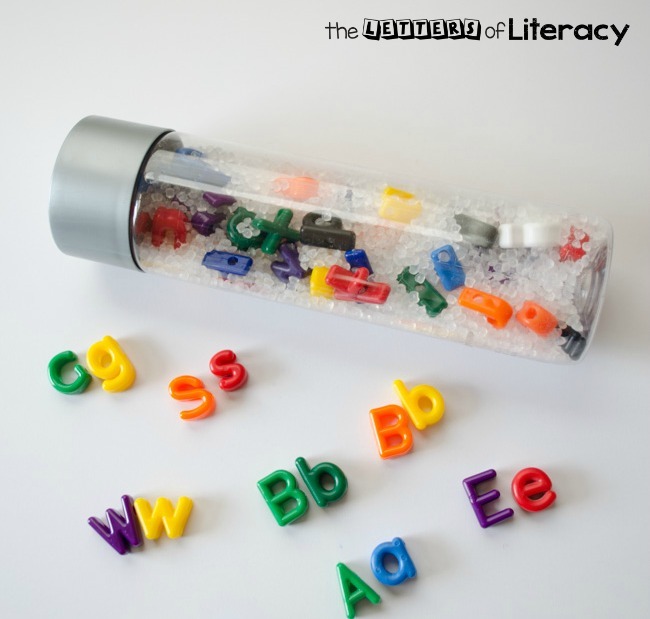 The Montessori philosophy puts a strong emphasis on letter manipulatives in teaching children to spell. Children in a Montessori setting use a movable alphabet which is made up of blue and red letters to help separate consonants from vowels. These are also a great teaching tool when young learners are exploring CVC words. There are so many benefits of letter manipulatives, as they provide an open-ended world for children to explore them. From toddlerhood to early elementary, they help build confidence and interest, giving children a strong literacy foundation. 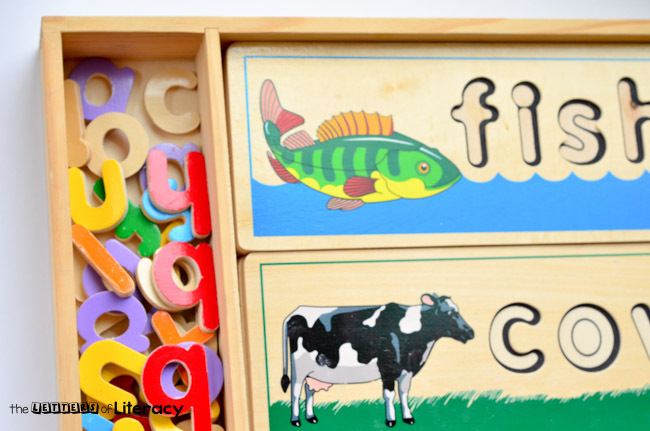 Looking for additional resources to help your child learn letters and sounds? Grab our Alphabet MEGA Bundle, which is packed with learning activities, games, and printables for each letter! 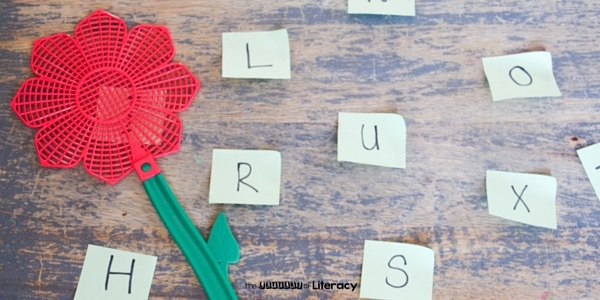 Here are some of our other favorite alphabet activities – your child is sure to love them too! 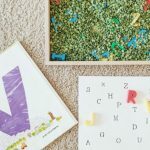 I’m grateful for your advice about the benefits of letter manipulatives for a child because they gain knowledge about the letters they interact with and they can also feel it. This is a great gift idea for my niece who will turn two next week. It’s good to know that letter manipulatives help the skills of the child grow into the ability to start identifying and associating upper case and lower case letters. Thanks for the tips! Happy 2nd birthday to your niece! What a special aunt she has in you. We are happy that you have found the benefits to Letter Manipulatives to be helpful. Have a wonderful week and have fun with your niece!